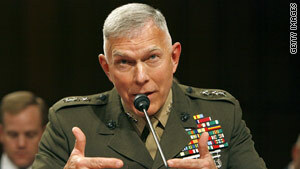 Marine Commandant Gen. James Conway says, "I would not ask our Marines to live with someone that's homosexual." (CNN) -- The Marine Corps' top officer says he would want to avoid housing gay and heterosexual Marines in the same rooms on base if the ban on gays openly serving in the military is lifted. "I would not ask our Marines to live with someone that's homosexual if we can possibly avoid it," Marine Commandant Gen. James Conway told a Web site in an interview posted Friday. "And to me that means we've got to build [barracks] that have single rooms." Asked about the possibility of gay and straight Marines living together, Conway told the site Military.com that he would "want to preserve the right of a Marine that thinks he or she wouldn't want to do that -- and that's the overwhelming number of people that say they wouldn't like to do so." Conway said the Marine Corps is the only branch of the armed services that houses two to a room. On Thursday, Defense Secretary Robert Gates announced that the Pentagon will start to ease its enforcement of the "don't ask, don't tell" policy prohibiting homosexuals from serving openly in the military. The change, which will take effect in 30 days and apply to all current cases, is a reflection of "common sense" and "common decency," Gates said. "These changes reflect some of the insights we have gained over 17 years of implementing the current law, including the need for consistency, oversight and clear standards," Gates said.